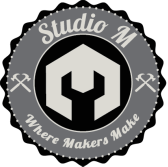 Studio M has had a wonderful first semester launching H.T.M. 's new exploratory class in 2016. Students have: mastered an array of tools, learned how to work and support a workshop environment, have honored the culture of making and have created amazing projects. Check-out some projects by Studio M below! 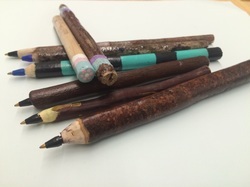 ﻿Students design and create a pen from a twig. Using coping saws, a drill-press, and belt/disc sanders students built the pen they would use for Studio M.
An automated animated box! To create the box, students had to move through four learning units/processes: carpentry, video-making, gears and circuitry. As a semester reflection project, students built a high-quality custom wood ring. Students reflected on all the tools they learned and being in a shop space. A project about how our identities are shaped through everyday actions. Students worked on a band-saw and scroll saw to cut out their profiles to design a box. Using sanders, the drill press and more, they were able to develop stronger carpentry skills. Maker students were asked to make a dice set using the bandsaw, sanders, and Dremel rotary tool. Aiming for high craftsmanship and quality, students are practicing their skills and how to move safely around the workshop space. e-textiles, wood sculptures, glass soldered boxes, paintings, drawings and, more!